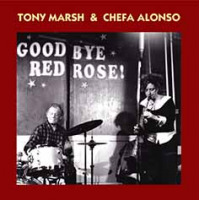 An air of nostalgia and remembrance pervades this album, starting with its title and cover photograph which portrays the duo of Spanish-born soprano saxophonist Chefa Alonso and Lancaster-born drummer Tony Marsh on stage at The Red Rose in Finsbury Park, north London, on 20th January 2008, during John Russell's long-running monthly improv concert series Mopomoso. In the photograph, the wall behind Alonso and Marsh features the album title in large letters, as the day in question was the last time the venue was used for music; it was eventually demolished in 2013 and is still fondly remembered as an improv venue that hosted many fine concerts and performers. So, this album's first two tracks feature some of the last music heard there. Although they were both members of the London Improvisers Orchestra, this concert was the first time that Alonso and Marsh played together as a duo, which they continued to do during 2008 and 2009, as evidenced by the other tracks here, three recorded in July 2008, at Flim Flam in London, and one in January 2009, at Huesca, during the duo's tour of Spain. Right from the first notes they played together as a duo, it was clear that the pair were ideally suited. Marsh had experience playing with saxophonists of the calibre of Mike Osborne, Paul Dunmall and Evan Parker and was adept at supplying subtle support that was never intrusive or rigid. Alonso was herself an experienced percussionist, so her saxophone playing easily fitted in well with Marsh's percussion. Together, the two had the enviable ability to reel off long, flowing lines that were totally compatible and easily became entwined, the whole process managing to sound natural and effortless. 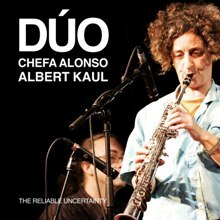 This duo came to an end in 2009 as Alonso completed her time as a student in London and returned to Madrid, where she remains active as an improviser. Marsh continued to play in a variety of ensembles in London until his untimely death from cancer in 2012. He lives on in the memories, thoughts and hearts of those devotees of improvised music who were fortunate enough to experience his playing live in concert or on disc. He also lives on in the fine music he left us, to which this album is a very welcome addition. Thank you, Tony. And Chefa and Red Rose, too. Track Listing: Goodbye Red Rose (Adios Red Rose) ; By the Hand (de la mano); FlimFlam one (FlimFlam uno); No es un truco (It is not a trick); Frusleria tres (FlimFlam three); Huesca (not Wesker).